Lately, I’ve been talking a lot about the other side of the activewear habit: practicing buying and having a reasonable amount of stuff, instead of getting carried away. Although the latest and greatest fitness gear is great fun, moderation and balance are still crucial. I already spent some time talking about how to trim down your existing collection, but another facet of that is that you might be feeling the need to simply buy less. If you feel like you need to put a damper on your shopping habits, here are 5 ways you can rein it in. Just like when you’re trying to decide what to keep, set stricter rules for yourself when choosing what to buy. If you have to debate whether to buy/return something, you should probably let it go. If your reaction isn’t “OMG YES”, then don’t be afraid to say no. I know I’ve been guilty of buying lots of “likes” and not sticking with “loves”. Odds are, if you know you’re trying to cut back, it’s because you already have plenty. If you have enough clothes to meet your needs but you still want to enjoy new things, try this rule: for every item you buy, you need to find one item in your closet to get rid of. This rule has two benefits. The first and most obvious benefit is that it keeps your numbers from ballooning out of control. The other less obvious benefit is that it forces you to ask yourself: do I love this new thing more than what I already have? If you’re not willing to give something up for it, that means it’s not better than what you already have. If it’s not a step up, why dilute your closet with things that are less awesome? More often than not, you probably won’t end up showing it enough for it to be worth it. Sometimes all it takes is that little bit of accountability to keep you in check, even if it’s just accountability to yourself. This strategy is really effective not just for spending, but for lots of things, like your eating habits. If you have to put pen to paper every time you make a purchase, it forces you to admit to yourself what’s actually going on. Every time you go out shopping or place an order online, write down what you spent on a page in a notebook or record it in a spreadsheet. Make sure you record everything in the same place so you can see what’s happening in the long view. Seeing those numbers all in one place might be surprising! If you’ve been turning a blind eye to how much you spend, this is a simple but effective way of reality checking yourself. Knowing you have to write down that transaction later might make you think twice before handing over your credit card. The natural extension of #3 is to take the next step and set a budget. Of course, once you decide on a number, you’ve got to find a way to stick to it! One popular approach is to use the envelope method. This means that you set aside actual cash in an envelope each month. Every time you spend, you have to use the cash from that envelope. Then, when the envelope is empty, no more buying til the next month! Another strategy is to use an online service like Mint to help you track your spending and stick to your limits. By the way, a good way to find out where your limit should be is to first track where your money is going like in #3. That will help you set a limit that’s reasonable for your individual situation. If you’ve been reading the past couple of weeks, I bet you saw this one coming. :) I’m just a few days away from finishing my 1-month freeze for the year, and I’m already happy with the results. Pausing your spending for a while can be a great way not only to save some money, but also to reset your mindset when it comes to buying. To get the most out of a freeze, I recommend stopping all unnecessary spending for one month. In my opinion, a week or two isn’t quite long enough, but any longer than a month may not be doable for most people. Read this post for more reasons why I think spending freezes are awesome. Doing a month-long freeze once a year (or more!) and practicing discipline with your spending really pays off–literally and metaphorically. Related to #1 (and #5)… during the freeze this month, I have kept a list of things I want (i.e., that I see reviewed on your blog, :-P). it’s amazing how many things I don’t want anymore (or don’t want as much as other things on the list) as March approaches. I think I may use this tactic from now on to help identify the true “loves”… My biggest problem is too much buying and RETURNING (an endless cycle). So now instead of buying it immediately, and then maybe/probably returning, I will write it down. if I still love it a week or two later, then great! Gah, your comment reminded me that at one point I had in mind for one of these strategies to be what you said: make yourself pause for a week or two before buying. That’s what I get for not writing down my ideas and relying on my memory. :P Tempted to go back and edit it, lol. This is totally anti-saving, but Sweaty Betty is having their big end of season sale right now. Lots of good stuff at 50% off. on a separate note- I love your blog, and I love how balanced it has been. 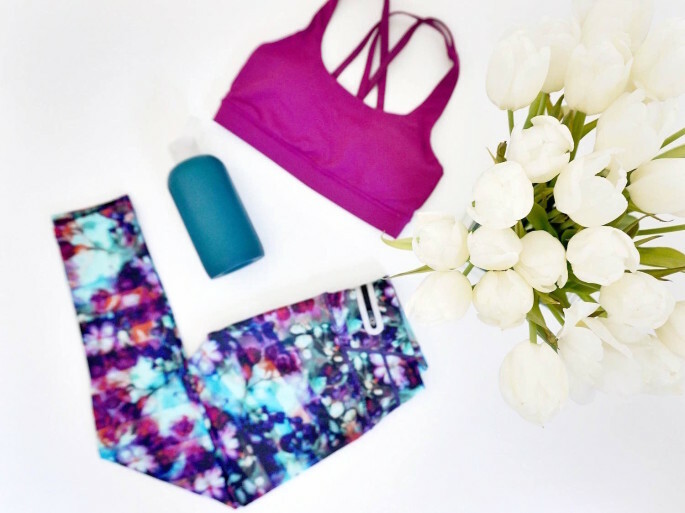 It’s really taken a tone of living well, rather than just the goal of being the ultimate activewear consumer. Some of the posters on other blogs make me feel kind of ill sometimes, talking about buying a bunch of stuff from Lulu and hiding it from their husbands, or maxing out credit cards, etc. Those comments make me sad… and I love that this blog is about more than that. Kudos to everyone who was able to participate in the spending freeze for an entire month! Although I have been leaps and bounds better at deciding whether I “need” to have something, I’m not at the stage where I am ready to freeze for more than a couple wks and have a hard time resisting a great sale! What I am definitely better at is diversifying my brands and that’s a big deal for someone who was a die-hard for a single brand. Great job on the freezes ladies! Whatever progress looks like for you is still progress! :) And yay for trying new things!! Love this. These all seem like great, totally implementable strategies for reining in spending on active wear and really anything you want to cut back on…except for maybe the spending freeze if your willpower is weak as it turns out mine is lol. I tried and so failed at the freeze, but at least my fail was for an absolutely love them pair of K-Deer leggings. Originally, after my fail, I was thinking of trying again in March, but perhaps I am just not ready to handle a freeze. So now I think I am going to apply strategies 1-4, and as the seasons come and go, let things go that I haven’t reached for in the previous season. Yeah, as much as I love ’em, spending freezes aren’t a viable solution for everyone. :) There’s more than one way to accomplish the same goal, anyway, which was basically the point of this post. :) Good luck with 1-4 instead! I’ve been on this ban with you this month. I’m also writing down every single time I spend money to keep track of it. And I have a wish list of stuff that I’m wanting to buy, however a few things have sold out already (which I’m actually fine with- it’s not the end of the world) and a couple of things I decided I don’t really want after all (crossed them off my list). I may actually do this a few times a year! I will admit it’s been a long and torturous month, but I am happy that I’m disciplining my shopping habits. What’s really helped me curb my spending is following your closet clean out project. I’d never taken an inventory of what I have, and it helped me give away a bunch of things that I no longer wear. However, it also made me realize something that wasn’t the intention–I love most of my stuff too much to get rid of it! So I’ve accepted that if I don’t want to get rid of it, I can’t get a lot of new things. So the one in, one out rule will be really critical for me to follow. Thanks for the tips! I am a big fan of spending freezes for one month a year, and then the rest of the year I stick to a strict monthly clothing budget. I set a dollar amount each month and stick to it. If I sell an article of clothing then that just adds to my budget for the month! The nice thing about it is it forces prioritization because you only have a set dollar amount to allocate. I bought a long-sleeve running shirt last week from lulu and decided to exchange it for shorts and a tank because it has gotten warmer and I realized how highly unlikely it would be that I’ll get much use out of the long sleeve shirt vs. a whole two seasons with a new pair of shorts. Without the budget, I would’ve probably just kept everything! Yessss, I love selling stuff for that exact reason! If I want something out of budget, then that compels me to find ways to clean out my closet a bit more–double win! And like you said, prioritization is a powerful thing for sure. Great tips. Sometimes I challenge myself to wear all of my headbands, for example, before buying any new ones. It helps to make a freezing ban more interesting and helps me to appreciate what I have in my closet.